SOUTH Africa's Finance Minister Tito Mboweni has said Zimbabwe is in a good position to adopt a new currency and that the regional giant would support its northern neighbour's efforts towards economic revival. Mr Mboweni said the use of the United States dollar was untenable given that Zimbabwe was under sanctions, whose removal he said was central to the country's economic recovery. 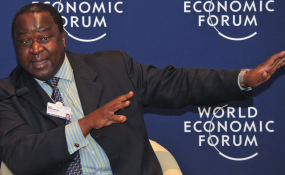 "I think the idea of using a new currency in Zimbabwe is a good one," Mr Mboweni was quoted as saying by ANA news agency as he addressed journalists ahead of his trip to Davos, Switzerland, for the annual World Economic Forum (WEF). "I think our colleagues there are on a good wicket when it comes to that space. We are working together very well, but at the end of the day it is Zimbabweans who need to fix their country," said Mr Mboweni. He revealed that South African government representatives, including National Treasury director-general and the Reserve Bank governor, had met with their Zimbabwean counterparts on December 26 in Johannesburg and had a conversation about the status of the Zimbabwean economy, the finance and banking systems, the attempts to reignite the economic health of Zimbabwe, the report said. The two sides reaffirmed their mutual commitment to working together to assist Zimbabwe. And the removal of sanctions was key to Zimbabwe's economic revival, he said. "But something that is beyond my powers, presidents will have to work together to ensure that whatever remaining sanctions in Zimbabwe are removed," Mr Mboweni said. "Those sanctions are causing big problems. Because if you want to go and do anything that involves the US dollar and you are under sanctions, political leadership hopefully will really do something to remove the sanctions. It is key and central to the revival of the Zimbabwean economy." The country has suffered economic, political and social harm after the West imposed illegal sanctions as retaliation for embaking on the land reform programme, which sought to ensure access to agricultural land by the black majority. Lines of credit were cut while the country was systematically isolated on the global arena, suffocating the economy. President Mnangagwa's administration has, however, prioritised engagement and re-engagement with all countries in a bid to create economically beneficial relations that will see Zimbabwe overcoming current challenges. The new dispensation has also opened Zimbabwe to foreign investment as part of wider efforts to revamp the economy. With regard to Zimbabwe introducing its own currency, Finance and Economic Development Minister Professor Ncube last week indicated that would be done "within the next 12 months". There has been growing support for the adoption of the local currency to spur economic recovery with the continued use of a multi-currency system. Redollarisation or adoption of the South African rand have been ruled out as the panacea to the challenges facing the economy.